Supposedly, a brand new car begins to lose value the instant you drive it out of the dealer’s lot, which is the sort of unfair depreciation that only Star Wars toys can really match. 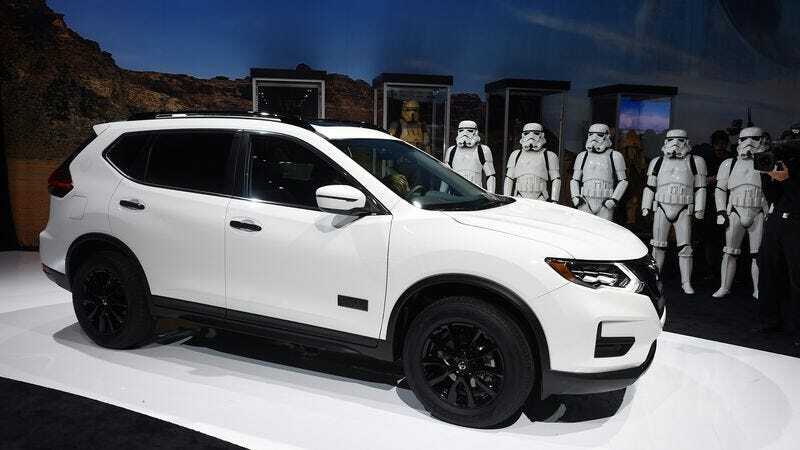 That means the limited-edition Star Wars-branded SUV that Nissan just announced is basically a ticking time bomb of worthlessness. Put a single mile on it and it loses value as a car. Scuff it up a little bit and it loses value both as a car and a Star Wars collectible. Really, the only smart thing to do with a Star Wars-branded car is lock it up in your house—not a garage, ew—and wait until the cycle of Star Wars nostalgia once again hits pre-The Force Awakens levels. Some nerd will pay a fortune for your Nissan in 20 years. Anyway, this comes from Motor Trend, which says the car is a 2017 Nissan Rogue SV. Appropriately designed to tie-in with the release of Rogue One: A Star Wars Story, the car has custom black wheels, Star Wars logos on the doors, Star Wars floor mats, Star Wars cupholders, and light-up Star Wars logos where the doors open. It even comes with a numbered replica of one of the Death Trooper helmets from Rogue One, just in case you want to look even cooler while driving it. The Rogue One edition of the Nissan Rogue is limited to 5,000 vehicles, and it’ll be available later this year for either $29,890 or $31,240, depending on if you want front-wheel-drive or all-wheel-drive. That may seem pricey for a Star Wars toy, but again, this is an investment (assuming you never drive it or touch it).